Today is a perfect day for a giveaway, don't you think? Family Volley believes in the power and importance of reading in our families and is happy to support this year's Hoppy Easter Eggstravaganza. The Hop is all about reading and books. 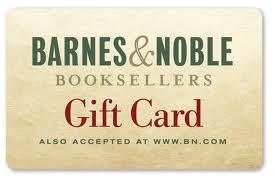 $50 Barnes and Noble Giftcard. Follow Family Volley by Email or Google Friend Connect and leave a comment saying hello. (Use the email button in the right sidebar or the follow button.) If you are already a follower, great! Additional Entries: Leave a comment for each "extra" you do. Follow Family Volley on Pinterest. Giveaway will run through April 12th. Hop hosted by I am a Reader, Not a Writer and Once Upon a Twilight. I was not compensated in any way for participating. This giveaway has no affiliation with Barnes and Noble. Opinions are all mine. i'm a follower.. hello! :) ..and thanks! I follow you with GFC and love your blog!! i follow Family Volley on Pinterest. Follow on Facebook. Signed up for email. I follow you on pinterest. Thanks for the giveaway opportunity!!! I am a follower. I love your ideas for family activities. I also like Family Volley on facebook. I followed via GFC - Thanks for the giveaway! i have a list of books i would love to get from B&N! i follow family volley! GFC: Megan @ Unearthly Reviews. Hello! Hope you have a happy easter! Thank you so much for this giveaway! I follow you on FB as Munnaza A.
I also follow you on GFC as infalliblyyours or Munnaza. I follow you via gfc as Dee and email. Followed by GFC - Nanners. Thanks for the giveaway! Hello - I'm a follower! Liked on Facebook as Stephanie Ward! I hope you have a wonderful Easter. Thank you for the generous giveaway. Thank you for this awesome giveaway chance!! I just got a Nook and would love to win and fill it with books! new follower here. Happy Easter. haha Thanks For The Giveaway! Thanks for participating in the hop and for the giveaway opportunity. I love visiting new blogs. Hey! Thanks for the awesome giveaway, I'm with GFC amber graff and I Liked You on FB(Amber Graff)! Hi there! Thanks so much for the giveaway! I just started following your blog. I love reading, I have especially enjoyed your pictures your posting to help you enjoy the small moments more and to slow down. Thanks for sharing. Hi! and Thanks for participating in the hop! Thanks For Hosting such a great giveaway. Have a Happy Easter! I follow you on Pinterest as Wendy. Awesome giveaway, thanks for doing it! Liked on FB as Lilian Cheng! Added on Pinterest as Lilian Cheng! Also liked your FB page as Reader's Edyn. Thanks so very much for the chance to win... it's appreciated! I'm a new GFC follower, Brooke. Thanks so much! I follow on RSS google! I follow you on Pinterest...yay! I'm new here and I love your site. Very easy to get around. Thanks so much for your giveaway! Thank you for this great giveaway! 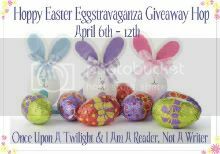 Love these giveaway hops because I get to discover great new blogs.